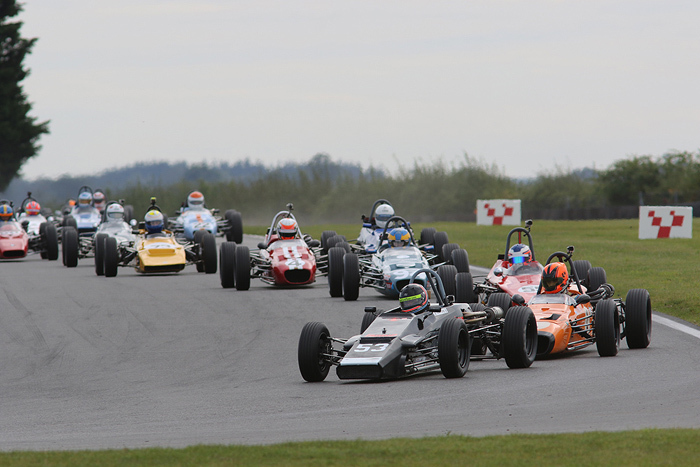 Two incredible Historic Formula Ford 1600 races capped an excellent day’s racing during the Historic Sports Car Club’s race meeting at Snetterton on Saturday (23 September). As the HSCC Historic Formula Ford Championship moves towards a dramatic season finale at Silverstone in October, the three leading contenders enacted some incredible racing at Snetterton as the wins were decided by 13-thousandths and then just one-thousandth of a second. As well as being incredibly close, the race action was of the very highest order in two sporting contests and it was Richard Tarling who won both races by the smallest of margins. Fellow title contenders Callum Grant and Michael O’Brien as well as Brands Hatch winner Cameron Jackson made up the lead quartet, with places changing at every corner and the result in doubt until the last few feet of the races. The first race was headed away by Tarling and Grant but once he’d got ahead of Jackson, O’Brien was able to move up into contention. O’Brien pulled off a demon move to lead over the line on what he thought was the final lap, but a pit-board problem spoilt his plan. On the proper final lap Tarling went back ahead as they charged into Riches three-abreast. He still led out of the final corner as Grant slipstreamed on the rush to the line but the Merlyn was just 13-thousandths behind with O’Brien a quarter of a second back in third and Jackson tagging along in fourth. In fifth was Max Bartell, one of the few drivers to have a relatively lonely race, while Will Nuthall just pipped teenagers Ed Thurston and Benn Tilley for sixth. The second race was just as good but Grant suffered a coil problem that slowed his pace and he could only just hang on in fourth as the other three battled for the lead. It all came down to the final lap and O’Brien seemed to have judged it perfectly as he led out of the final corner at Murray’s. But Tarling dug deep and dived out of the tow on the dash to the line. In a photo finish, Tarling got the win by the smallest margin available, one-thousandth of a second. O’Brien was gutted to lose the race by such a small margin after a tremendous drive while Jackson was in touch in third from the struggling Grant. Bartell just held off Nuthall and Thurston for fifth while Rob Smith completed a double win from the over 50 ranks. It had been a day of Formula Ford racing of the highest order and from 64 race starts there were just three non-finishes across two races. The Silverstone Final is now set to be another thriller. 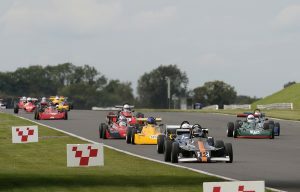 The combined Classic and Historic Formula Ford 2000s races featured a fantastic 32-car grid and there were battles all the way down the order. URS Classic racer Marc Mercer swept away to an impressive brace of wins as Jon Finch led the pursuit while Davy Walton scored his first Historic FF2000 win in the opener. In the second race, Ian Pearson was the star, as he raced to Historic victory and second overall from dead last on the grid for the opening race. Former multiple Classic champion Pearson had not raced for nearly a year while restoring his Royale RP30. The car was finally ready for Snetterton but a radiator problem in qualifying left him fighting up to tenth in the opening race and then second by the end of the afternoon. 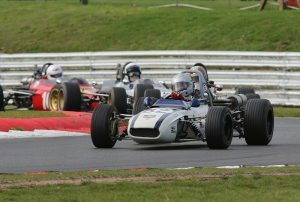 Will Mitcham was peerless in his father’s U2 Mk2 in the front-engined Formula Juniors and scored two commanding wins. In his wake, Alex Morton (Condor SII) and Nick Taylor (Elva 100) had two brilliant battles for second place and Morton emerged ahead, but in the later race the gap was just 17 hundredths of a second. Mark Charteris was another double winner in cars from the Mallock stable as two more Classic Clubmans wins underlined his 2017 title. Spencer McCarthy and Alan Cook emerged best of the chasing pack along with John Harrison while Clive Wood made certain of the B Class title with two more wins over friend and rival Barry Webb. Andrew Hibberd was in a class of his own in Historic Formula 3 and won both races but a healthy margin. Peter Needham (March 703) fended off Michael Scott (Brabham BT28) in both races despite a concerted effort from the Devon racer as Needham took his best result to date in his March 703. Gaius Ghinn moved closer to the Classic Formula 3 Championship title with a two wins in his Ralt RT3. In both races Pat Gormley gave valiant chase in his ex-Patrick Neve Safir and kept Ghinn on his toes. Julian Stokes (Tecno) was the best of the concurrent Classic Racing Car contenders and mixed it with the newer F3 cars.